EASY CARE LONG-LASTING MATERIAL - 100% Cotton Fabric, machine washable. Wash with cold water, gentle cycle & tumble dry low. Low iron if needed. Do not bleach them or run them through a hot dryer. ABSORBENT AND LOW LINT - These towels are absorbent and dry quickly, hang by the corner loop; machine washable and durable for daily use-Get the job done quickly the RIGHT way with these versatile towels! 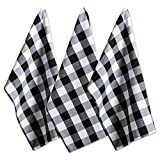 GREAT GIFT CHOICE - Classic Check design will match to most kitchen décor. Makes a great hostess gift for Thanksgiving dinner or parties, give as a gift to cooking or baking lovers for Christmas, Mother's Day, birthdays, or housewarming. MORE DII OPTIONS FOR YOUR HOME- DII offers an assortment of delightful products including kitchen linens, storage solutions, pet supplies, rugs, throws, and more, to explore our other collections click the DII link at the top of the page.